The design and conception of the Sony Centre emerged from a cooperation of Helmut Jahn and Ross Clark during a competition in the year 1992. The concept of that time did not change up to now and was adopted by Ross Clark’s follower Markus Schulte. 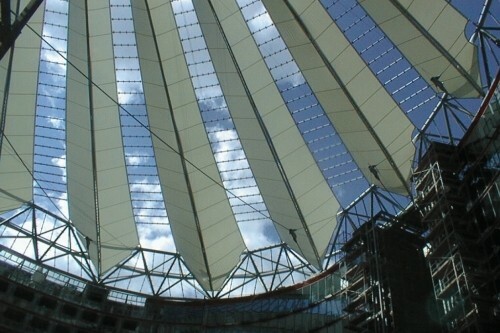 The focus of the Sony Centre at the Potsdamer Platz in Berlin is an internal elliptical plaza, ”the forum”, which will be accessible through portals in the surrounding buildings. To extend the use of this forum it will be covered by the forum roof. The structure was developed from a geometric exactly defined shape of an inclined hyperbolic cone. 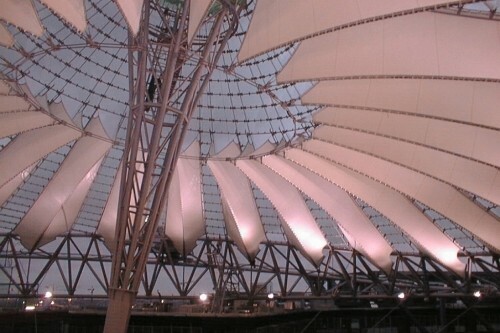 The edge of the elliptic section was formed by a truss and in the rotation axis of this cone an “air – column” with a height of 42,50 m was designed. Radial cables connect the bottom and the top of the “air – column” with the elliptic truss. The primary axis of this truss has a length of 102 m, the secondary axis a length of 77m. Because of the complex geometric structure of the Sony Centre specific studies concerning the wind loads as well the snow loads were necessary. The wind loads were determined in a wind tunnel in Ontario, Canada, using a model of the Sony Centre (scale 1 : 400) including the adjacent buildings. 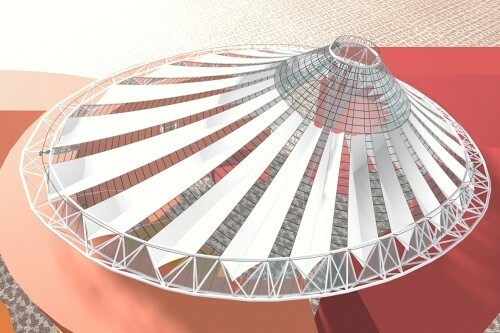 Doing so, the calculation of the forum roof was based on realistic loads. 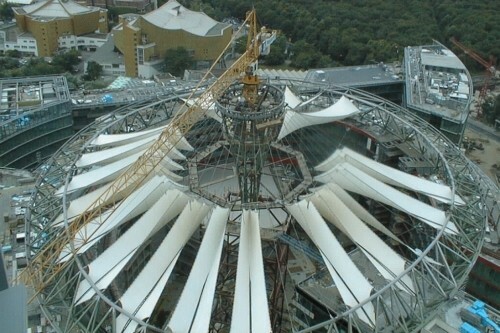 The analysis of the load bearing capacity as well as the analysis of the serviceability was realized using a computer – model (~ 55000 joints) with membrane, cable and beam elements. About 45 different load cases and load case combinations with different load increasing factors were considered. The calculation-time for one load case was at this time about one day. A further challenge represented the calculation of the glazing. Due to the different geometries as well as the different loads (twist, wind loads and snow loads) it was necessary to calculate each of the 876 glass panels. Additional the 5600 supports of the glass panels had to be calculated.